Purchased 11/2010 from a local school district. This machine had been in storage for several years. Machine was completely disassembled, cleaned, sanded and repainted, bearings both for the motor and jointer head replaced, along with the belt, power cord and blades. This is a 4 bladed machine with a 1HP motor. Cast iron base has the raised ribs polished along with other machined surfaces. My father was in the cabinet (commercial) business all his life. I have his tools. serial # AY 1269. motor has reversing switch, 1/2 horse. I have all the knives ans set-up for countless work. works fine. same effort as above. 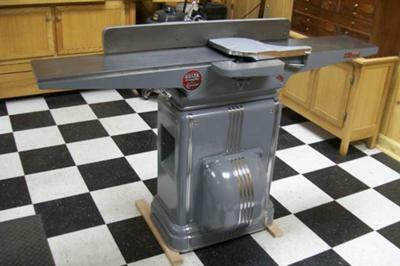 I want a buyer with appreciation for vintage power tools. Usede in factory. 3.) 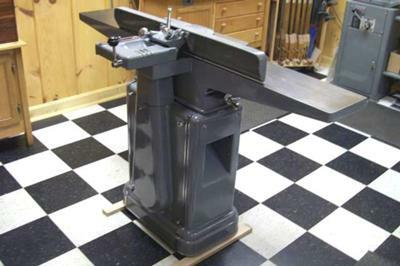 Craftsman 62" band saw, also used in factory. Works fine, custom stand, old too. Any suggestions as to value and who may have interest? I love your Grand kids comment. A great rig, and an amazing job bringing it back to life.